In the late 1920's end 1930's a rough landing strip was made on the farm of C.C. Anderson just outside of Walterboro. Starting in 1941, as part of the World War II effort, the U.S. Government acquired the site of the strip and assembled a total of 3,815 acres for the Walterboro Army Airfield. Construction began in April, 1942, and just four months later, on August 4, 1942, the base was acti- vated. The completed installation consisted of a large Airfield with extensive support facilities. Army Air Forces Fourth Service Command conducted combat Air Crew training. The Tuskegee Airmen were part of this effort. They were located near Tuskegee Circle, which is now the site of Walterboro High School. Many notable objectives were completed here. Trained pilots and crews went directly to combat in many parts of the world. 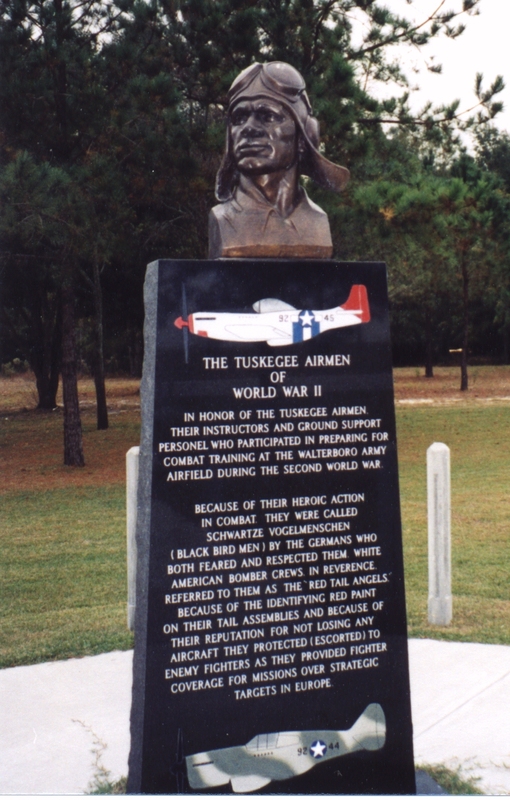 Seven of the famous Doolittle Tokyo raiders were trained at Walterboro. There was a com- pound for German prisoners of war. The largest camou- flage school in the country was located here. Approximately 600 acres were used for bomb storage. Air Combat support was provided from Walterboro for many important defense facilities and cities, such as Santee Cooper Dams, the Parris Island Marine Base, the Navy Yard and Charleston. This was a very desirable Airfield Iocation because it had good flying weather and was beyond the range of hostile Navy guns. Effective 15 November 1945, the total installation was classified as surplus. Quit claim deeds conveyed the property to the Colleton County/Walterboro Airport Commission. AIRFIELD DURING THE SECOND WORLD WAR. REFERRED TO THEM AS THE "RED TAIL ANGELS"